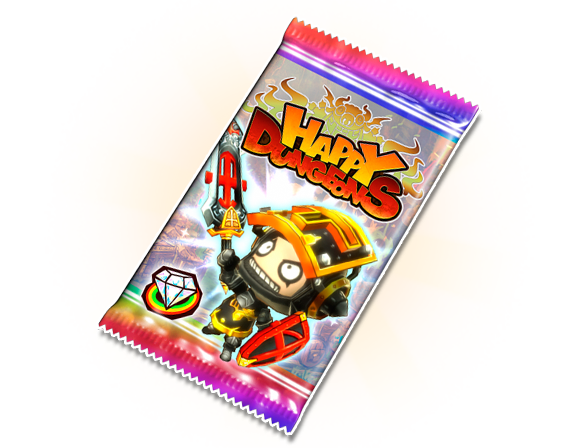 Happy Cards are magic cards, with the power of armor or weapons sealed up inside. Players who spend their Happy Jewels or Happy Stars in order to open up Happy Card packs will be able to get their hands on powerful equipment items. Happy Cards These are cards packs you can buy using either Happy Jewels or Happy Card Free Passes. Limited Edition card packs increase the chances of obtaining certain kinds of items, but are only available for a limited time during campaigns. These are card packs that can be opened using Happy Stars. They are mainly dropped in the dungeons, and only give rare items very they are mainly dropped in the dungeons, and only gibe rare items very occasionally, so you're really lucky you get one from Happy Cards Lite! The drop rate differs on an item-by-item basis. Even items of the same rarity sometimes have different drop rates. if you get multiple items at one time, there is a possibility you will receive duplicate items. Any items you acquire with Happy Cards that cannot fit in your inventory will be sent to your Inbox. Statistically speaking, of those who play 100 times in a row to get an item with a 1% probability of appearing, 37% of players will not receive a single one.